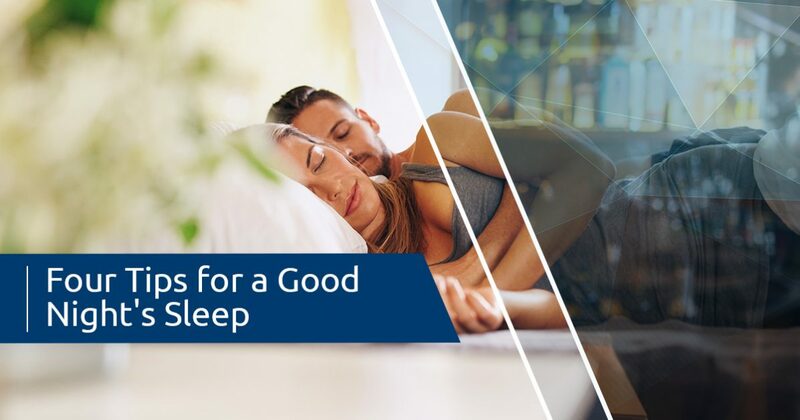 A good night’s sleep is a key component of your physical and mental health, but if you’re like many Americans, then you may not be getting at least seven hours each night. In today’s post, we’ll provide you with four tips that can greatly improve the quality of your sleep. When you’ve finished reading this post, get in touch with Men’s Vitality Center in Tucson to schedule an appointment. Whether you’re interested in learning more about testosterone replacement therapy or you need an annual physical, our men’s health center is here to provide you with the support you need. You’ve probably heard this point over and over again, but its importance cannot be understated. 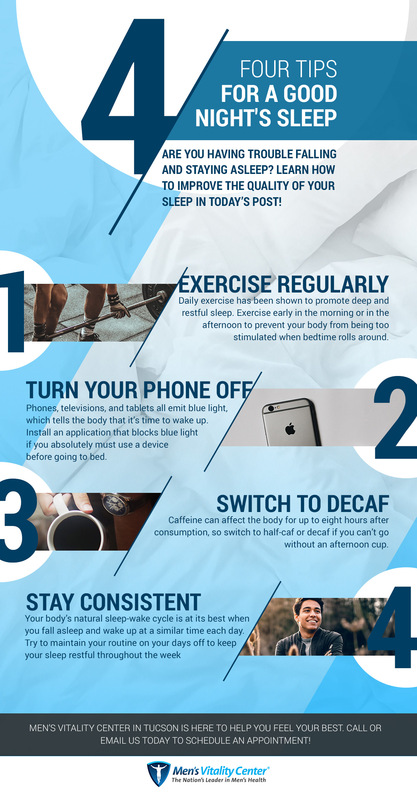 Regular exercise benefits your body in countless ways, and while it takes months of hard work to achieve noticeable results in the gym, you’ll notice that the quality of your sleep improves immediately. As we noted in a previous post, lifting heavy weights or engaging in high-intensity interval training (HIIT) is also a great way to naturally increase your testosterone levels. Whether or not you’re currently receiving testosterone replacement therapy, you’ll be able to notice a difference in your well-being and energy levels when you exercise regularly. 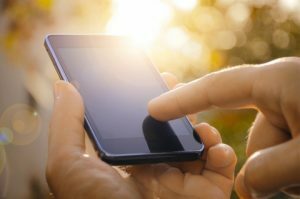 Your phone, tablet, and television all emit blue light, which reduces your body’s production of melatonin and signals to your body that it’s time to wake up. Blue light is beneficial to the body when it’s actually time to wake up, but blue light exposure is perhaps the most common cause of insomnia in our society. While you can use filtered glasses and install programs to limit the amount of blue light emitted by your devices, it’s best to unplug an hour or two before you plan on going to bed. This allows your mind to unwind and become naturally tired without the stimulation of social media and web browsing. More than 90 percent of the US population consumes caffeine on a daily basis, but if you’re having trouble sleeping, then you should try switching to decaf after lunch. Caffeine can stay in the body for up to eight hours, so try to have your last cup by noon or 1:00 p.m. at the latest. If you can’t make it through the day without your afternoon Joe, then try to slowly transition to a half-caf blend while exercising at some point during the day. Your body’s internal clock (circadian rhythm) naturally regulates your sleep-wake cycle, and this cycle most commonly aligns with the sunrise and sunset. If you’re having trouble falling asleep and staying asleep, then try to make your nightly routine as consistent as possible. This can be difficult if you work shifts at different times of the day, but striving to be as consistent as possible will promote better sleep in the long run. For the best results, try not to sleep in too late on the weekends or stay up far later than usual — you’ll notice the difference when Monday comes around. Men’s Vitality Center in Tucson is your resource for a variety of men’s health services, including physicals, testosterone replacement therapy, weight loss programs, and more. We would love to help you become a happier, healthier individual. Please get in touch with us using the form below to schedule an appointment. We look forward to seeing you soon!